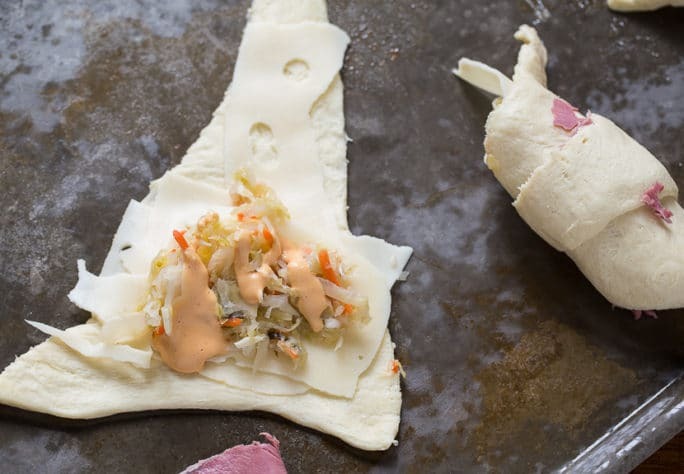 Quick and easy Reuben Crescent Rolls are super fun to make and eat. 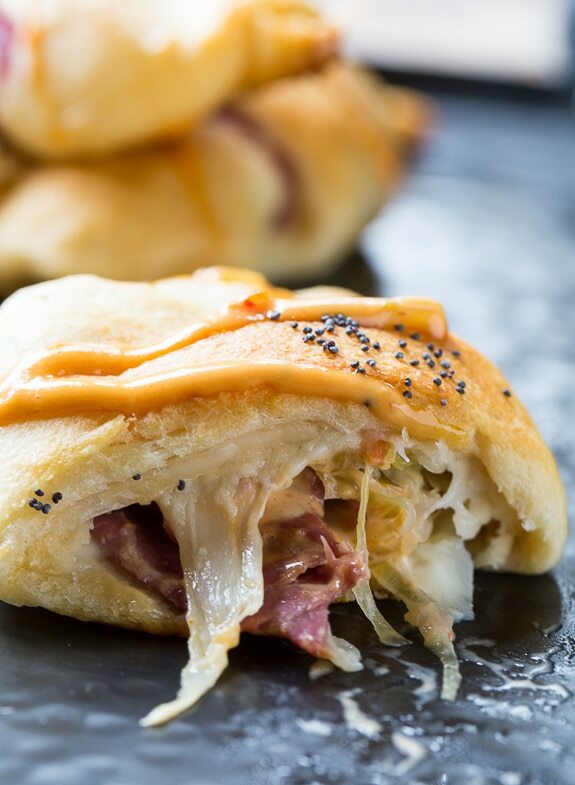 They are stuffed with corned beef, swiss cheese, sauerkraut, and drizzled with Thousand Island dressing for a twist on the classic deli sandwich. They are great for serving either as an appetizer or as a snack. A Reuben would not be a Reuben without kraut (although I think coleslaw totally passes on a turkey reuben). Recently I got to try some really amazing kraut which was very exciting to me because the kraut options at my regular grocery store are very limited. 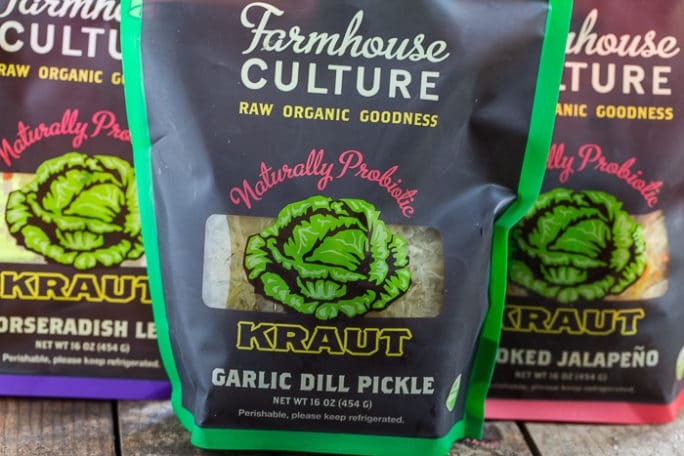 Farmhouse Culture claims to “make the Best Darn Kraut on the planet by infusing regional organic ingredients with wildly imaginative flavor profiles.” I can’t attest to whether it is the best kraut on the planet but it is for sure the best I’ve ever tasted. The kraut comes in amazing flavors: Classic Caraway, Smoked Jalapeno, Horseradish Leek, Garlic Dill Pickle, and Ginger Beet. They also make a Wasabi Ginger Kimchi. I absolutely love the flavor combinations and I had no idea there was even such a thing as flavored kraut. Creativity, when it comes to food or pretty much anything, always sparks my interest. The Farmhouse Culture Kraut comes packaged in pouches instead of cans or jars. Farmhouse Culture Krauts aren’t heated or pasteurized so they contain those awesome living probiotics. The pouches have a ferment-o-vent which allows the “living” kraut to breath, plus the pouch reduces their carbon footprint by 2/3rds. You can find Farmhouse Krauts at Whole Foods in the refrigerated section and you can also check the Farmhouse Culture website to see where it is available in your location and learn more about this awesome kraut. I went very traditional and used the Horseradish Leek flavor in this Reuben adaptation, but there are all kinds of things you can do with kraut. The Smoked Jalapeno Kraut is totally going in a burrito or quesadilla. Not only does the Horseradish leek Kraut taste fresh and has a nice crunch, the leeks really add flavor and the horseradish gives it a little zing. 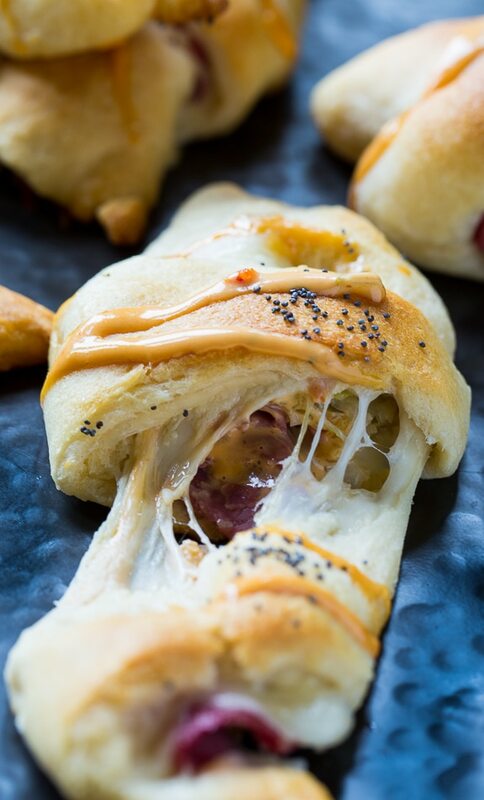 You’ll love the taste of Reuben ingredients wrapped up in buttery crescent roll dough! 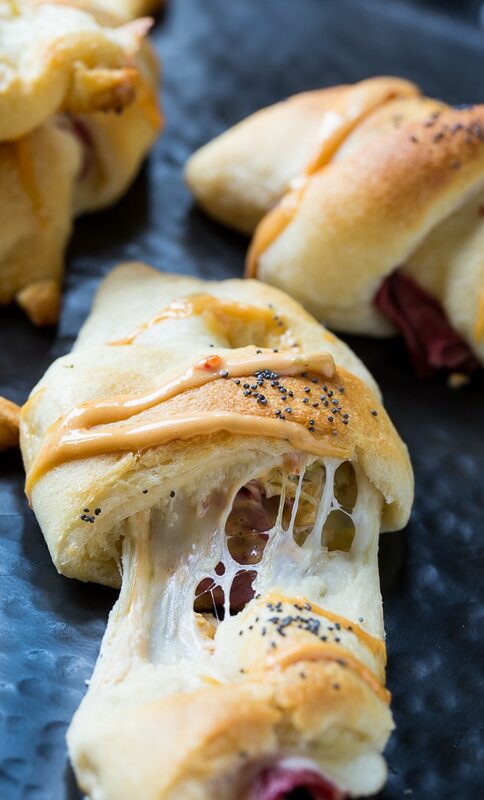 Reuben Crescent Rolls make a fantastic snack or appetizer. 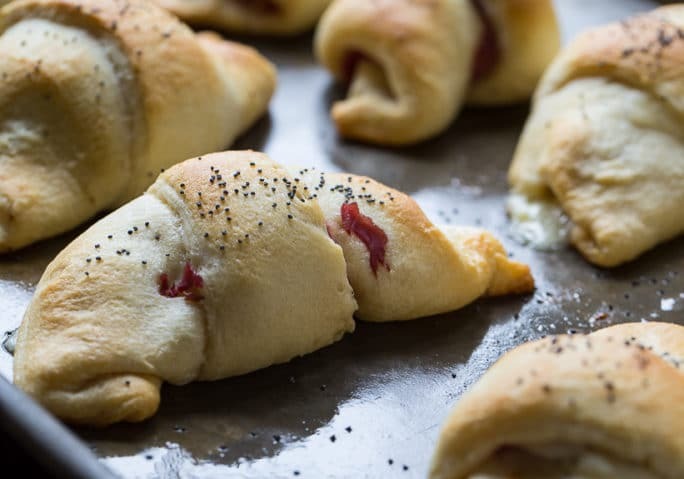 Reuben Crescent Rolls are easy to make from refrigerated crescent roll dough. Stuffed with corned beef, swiss cheese, kraut, and Thousand Island dressing. Preheat oven to 375 degrees and lightly spray a baking sheet with cooking spray. Separate the crescent roll dough into triangles. Tear a piece of corned beef into pieces and using half of it, shape it on top of dough, placing it mainly at wide end. On top of the corned beef, do the same thing with the cheese. Next place a spoonful of kraut and a drizzle of Thousand Island dressing. Layer remaining corned beef on top. Having the kraut, cheese, and dressing sandwiched between the corned beef will help keep the rolls from becoming soggy. Starting at the wide end, roll the dough up. Place on baking sheet. Repeat for remaining 7 pieces of dough. You will want to serve these immediately because they tend to get soggy over time. Disclosure: I was sent coupons for the kraut but I was not compensated for this post. All opinions are mine. This entry was posted in Appetizers and tagged kraut, organic, reuben. Bookmark the permalink. I made these the other week and they are pretty great! They were a little bigger than I expected and I somehow managed to pick a crescent roll that had too much sweetness in them, but they were still totally good! This is genius…I am totally making these. 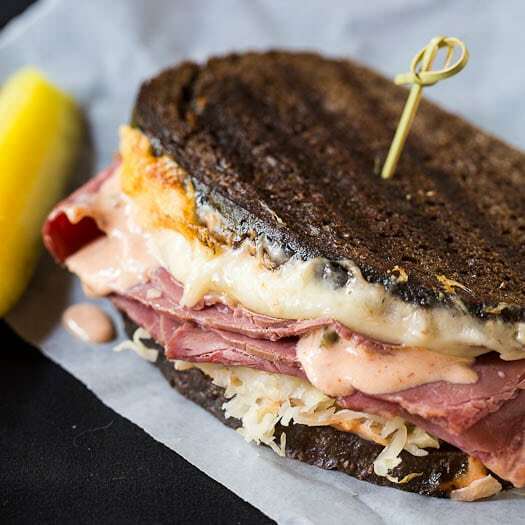 I love love love Reubens, and this is such an awesome variation! Yum.. I love savoury crescent rolls, especially when they are filled with as much cheesy deliciousness as these. Raw sauerkraut is the BEST! I hate that most brands pasteurize it. Farmhouse is really awesome… I have visited them at the farmer’s market in San Francisco a few times and I always buy it when I venture to Whole Foods to grocery shop! These crescent rolls look soooo good. Reubens are my fave! This looks so good!! I love cresent rolls, but for some reason I never make them. This looks like the perfect twist! This reuben rolls are so cute! My mom is a reuben sandwich addict and would LOVE these! These are such a fun way to use up leftover corned beef, and that kraut sounds delicious! 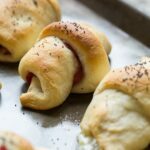 I love that you used crescent rolls for these! Such a great idea! That melty cheese is totally mesmerizing! My German hubby is seriously OBSESSED with Reubens. I am pretty sure that he would be happy if he ate NOTHING else EVER. So these crescents? Totally getting wife bonus points when I make them for him! Pinned! It seems like yesterday I commented on your corned beef sandwich, and now you’re tempting us with another corned beef recipe! What a cool idea! Pinned! These are so creative and awesome!! Mixing crescent rolls with a sandwich is such a great idea! And I need to find that garlic dill pickle kraut asap!! Those krauts look so good. I have got to try them. Reuben sandwiches were my favorite when I was a kid. I bet these are great! Oh my! THAT filling! There is so much I love about this amazing recipe. I love reubens but my boyfriend doesn’t. Maybe I could trick him into eating them if they looked like this! Those are some crazy Kraut flavours! I’m loving these cute portable Reubens! These are so creative, Christin! Such a fun twist on a regular reuben sandwich. Looks delish!